Please note: Before you install anything it’s important to create a backup of your shop. It’s a good idea to do this every time you install a new extension or make changes to your store. Log in to your Magento account. 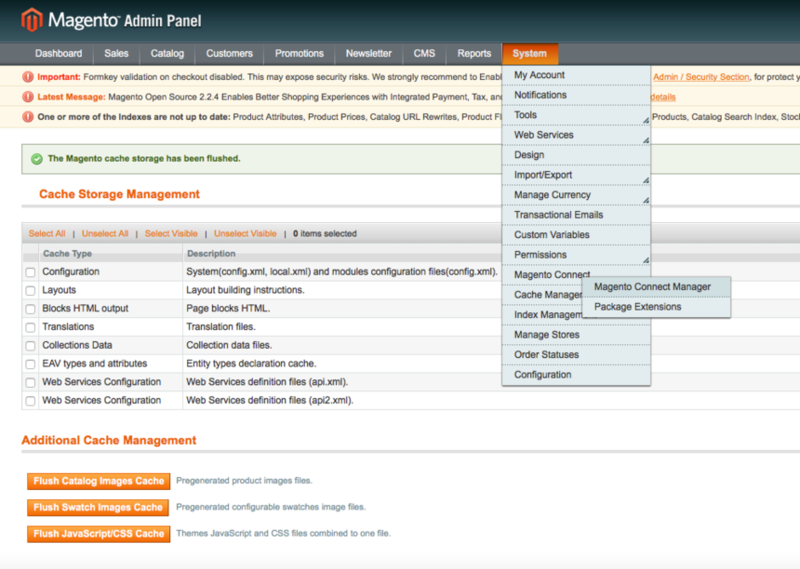 Navigate to System –> Magento Connect –> Magento Connect Manager from the main navigation menu. Once you are inside the Magento Connect Manager click on the link to the Magento Connect site under the heading "Install New Extensions". This link will take you to the Magento marketplace web page. Go to the search bar in the top right-hand corner. Type in “helloretail” and click on the one that fits magento 1.Once you land on the page you should be able to add the extension t your basket by clicking the "Add to cart" button in the right column. Navigate to the basket page and complete the purchase. once completed you should see an order confirmation - on this page click the "install" button. Go back to your shop (which should still have Magento Connect Manager open) and paste the key in the input field - once pasted you can click the install button. When the extension is ready it should show up on the page. Make sure you REMOVE the checkmark for maintenance mode. Now click the proceed button. A black screen will appear with green messages shown on it. Once you see the message “Cache cleaned successfully” the installation is complete. Refresh the page and then click “Return to admin” in the top right-hand corner. Download the helloretail extension directly from this link helloretail extension package for Magento (newest version is 1.0.12). 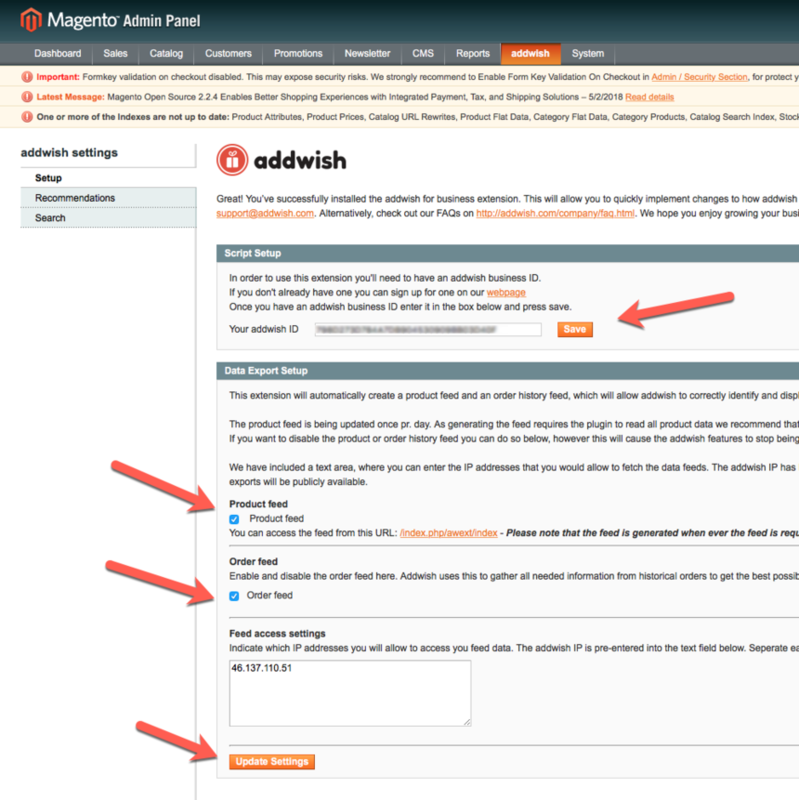 Once you have the file you should navigate to your magento connect manager (as seen in picture 1 above). Locate the header "Direct package file upload" and click the "Choose file" button. Now locate the helloretail extension on your computer and press the "upload" button"
In order to connect the Magento extension with your helloretail account you will need to find your helloretail partner ID. Log into your helloretail account ( helloretail.com/company/signin.html ), click on one of your webshops and navigate to "settings -> tracking script" - Here you can see a field containing your partner ID. Go back to your Magento admin page. after installing the extension you should have a new tap (button) in the top menu bar - click this and then click “helloretail configuration”. Under the heading “Script Settings” there is a field called "helloretail ID" - paste your helloretail partner id to this field and click "Save". Now scroll down to the section called “Data Export Setup”. Check the boxes next to “Product feed” and “Order feed”. - This allows helloretail to access your product and order feed. In “Feed access settings” helloretail's IP address are displayed, which mean only addwish will be able to access the data from your product and order feed. if you wish access from somewhere else you can add additional ip's in a comma separated list. Press “Update settings” to save the changes. Great, you’re ready to go!